Penelitian - A chip-scale device that uses confined light to emit and detect audio signals simultaneously has been developed by researchers from China and Japan. Recent findings have shown that quantum wells, thin semiconductors films that trap electric charges, can act as light-emitting diodes (LEDs) at the same time. It is termed the simultaneous emission-detection phenomenon. Yongjin Wang at the Nanjing University of Posts and Telecommunications and colleagues now report a technique to use light-emitting quantum wells for high-speed signal communication. 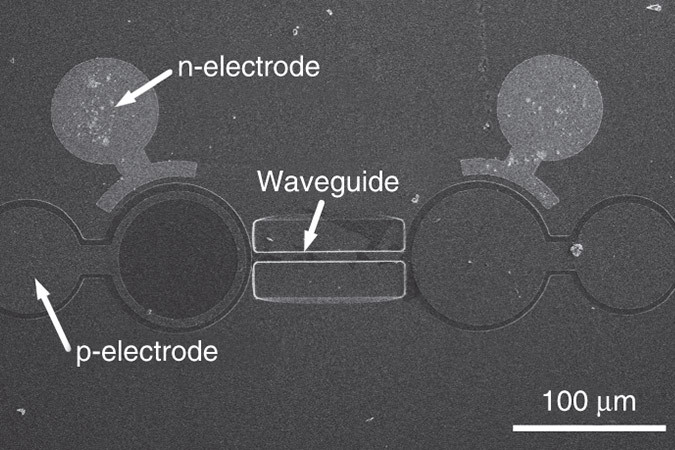 The team fabricated two quantum wells on a III-nitride chip and then connected them through a suspended optical waveguide. Photocurrent measurements revealed that light generated on one side of the device could travel through the waveguide and modulate the output of the second LED. Connection to an external audio circuit enabled the quantum wells to receive sound signals and amplify them almost instantaneously.